The footpath, marked in white and red, leaves from the eastern part of the old town of Monterosso. Take the small pedestrian road leading to the Hotel Porto Roca. The path begins with a long staircase crossing vineyards and citrus orchards. The footpath continues flat, but in some parts it is very narrow and without protection on the side of sea. Some parts are broad and peaceful, and you can always enjoy a wonderful panorama over the sea. The vegetation is very various, you will find evergreen oaks, arboreal heather, broom, juniper. The footpath passes on an antique stone-bridge, which is really worth a picture. When the trail begins to go down, the view of Vernazza is really breathless. The path continues to go down among olive trees and cultivated fields, then it enters into the town along the small lanes and ends in the small harbour of Vernazza. 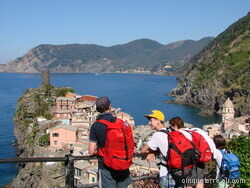 The footpath leaves from Vernazza, and reaches in few minutes the second tower of the fortifications. The ascent continues not too much steeply until the viewpoint Punta Palma (208 metres above sea level). The path continues with a succession of not difficult ups and downs overlooking the beach of Guvano immersed in cultivated fields, olive groves, vineyards and flowery meadows. 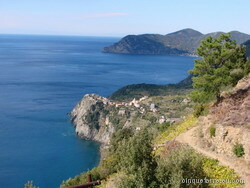 Continuing on this trail you will after an easy slope reach the town of Corniglia, the smallest of the five villages. Corniglia lays on a small cape, 100 metres above the sea. 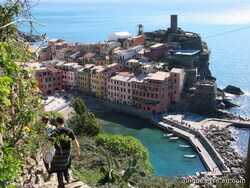 Take the stairs (380 steps) down to the raiway station of Corniglia and continue the path following the railway lines. The path continues almost flatly and you will reach the bungalows of the Holiday Village Europa, a bar and a beach with rocks which invite you to have a bath. Once arrived at the characteristic cemetery follow the path and you will reach the picnic area from where you have a wonderful view over the houses and the wonderful port of Manarola. A tunnel will lead you to the railway station. The famous Via dell’Amore, "Lover’s Lane", starts at the railway station of Manarola with stairs. It is the most popular stretch of path of the Cinque Terre, excavated in hard rock, winds along the coast on rocks overhanging the sea. The history of the Via dell'Amore is connected to the construction of the railway between Genoa and La Spezia (1926-28). 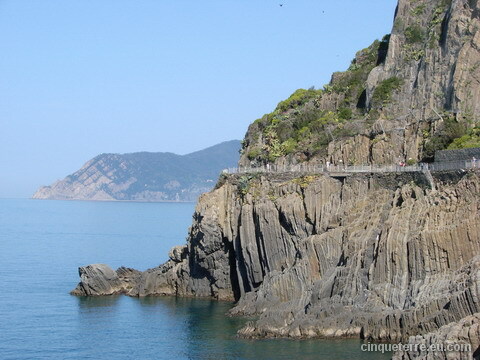 In order to construct a tunnel between Riomaggiore and Manarola two paths on rocks overhanging the sea were necessary. During summer the Via dell'Amore's romantic atmosphere gets a bit disturbed by the excessive number of tourists. Nevertheless we recommend you to have a rest along the street, on one of the numerous benches excavated into the rocks. At the end of the Via dell'Amore, going downstairs, you will arrive at the railway station of Riomaggiore. Riomaggiore with its tiny harbour is a colourful pearl encompassing all the charms of an ancient fishing village. Description: This is a challenging hiking tour which starts with a long ascent (45 minutes). Our trip takes us through silent pine forests by a 15th century Sanctuary of Montenero. 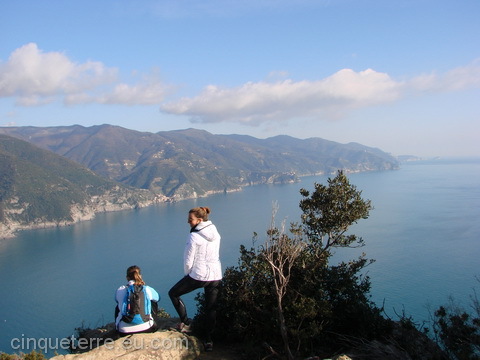 This is a perfect place for a rest, enjoy the breathtaking panoramic view of the whole coastal line of the Cinque Terre. Ascending to the top of the ridge which separates this coast from La Spezia. Then starts the most evocative part of the trail, a spectacular cliff-side path with a magnific view over the Mediterranean Sea and the islands of Elba, Capraia and Korsika. 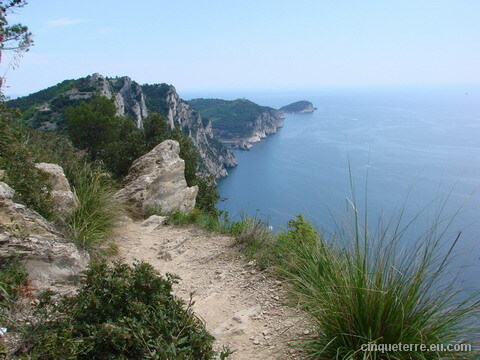 A wooded trail continues along the ridge and emerges at the gulf of La Spezia where we descend to the town of Portovenere. Time for a celebratory drink in the harbour! From Portovenere there is a boat connection back to Levanto at 5 pm. The trail starts in Levanto at the southern end of the beach promenade. Follow the stairs up to the castle (castello). This path is an old donkey trail and goes through pine forests and Mediterranean vegetation. Nice views over Levanto as you climb the hill. Follow the trail through the forest until you reach the Punta Mesco (semaforo). Follow the path to the right and you will find the ruins of the Chapel of St. Antonio and the old lighthouse. From here breathtaking views of all the five Cinque Terre villages. Many stairs down to Monterosso. 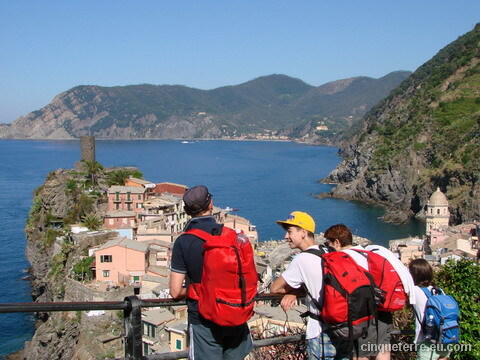 Click here for detailed situation of the Cinque Terre footpaths. 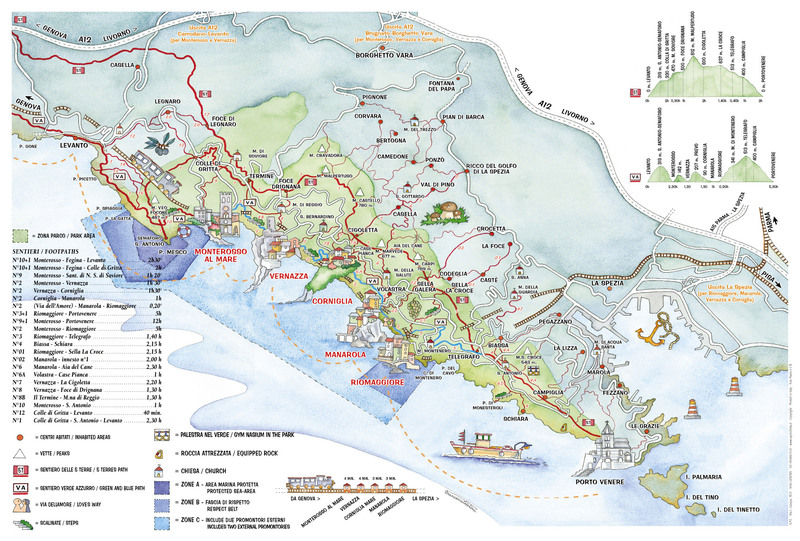 Map of the Cinque Terre footpaths (click on the image to enlarge). 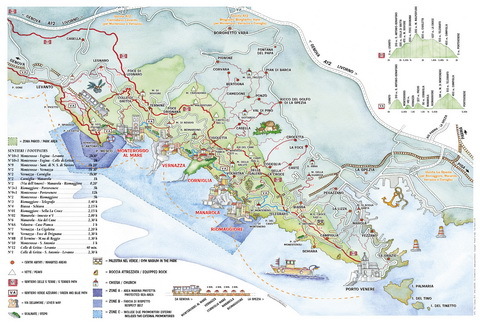 You can find more maps on Cinque Terre Maps.